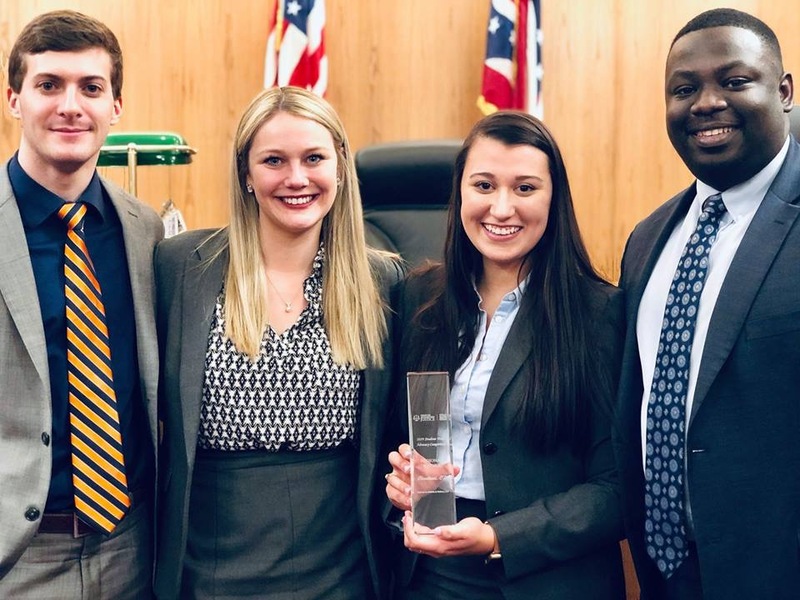 The University of Akron School of Law’s Trial Advocacy Program continued its successful 2018-19 season with its most dominating performance of the year, taking both first and second place at the American Association for Justice’s (AAJ) Student Trial Advocacy Competition’s Regional Championship in Cleveland this past weekend. Akron Law’s first-place trial advocacy team, from left: Justin Morgan (3L), Sarah Blank (3L), Cassandra Rosa (3L), Imokhai Okolo (2L). 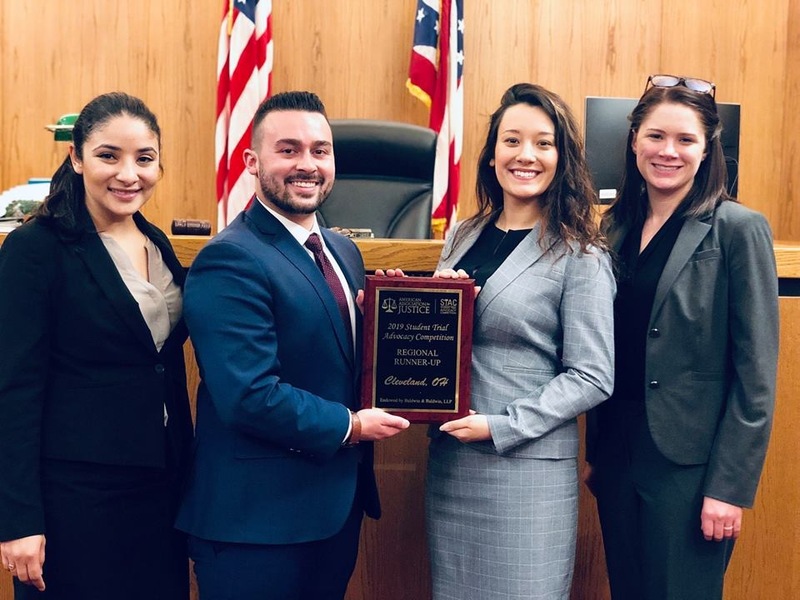 Akron Law’s second-place trial advocacy team, from left: Alexis Torres (3L), Cole Blakely (2L), Samantha Nagy (3L), and Kristin Leuchtag (3L). The AAJ competition is one of the largest national mock trial competitions in the country, featuring 226 teams from 137 different law schools. The teams are divided amongst 14 regions with the winners of each region earning an invitation to the National Championship, this year hosted in Philadelphia. The Cleveland Region featured competition from Capital University, Case Western Reserve University, Cleveland State University, Drake University, Michigan State University, University of Michigan, University of Notre Dame, and, of course, the University of Akron. Each school brought two teams. The University of Akron’s first team consisted of student advocates Cassandra Rosa (3L), and Imokhai Okolo (2L); and student witnesses Justin Morgan (3L) and Sarah Blank (3L). Akron’s second team consisted of student advocates Cole Blakely (2L) and Samantha Nagy (3L) and student witnesses Kristin Leuchtag (3L), and Alexis Torres (3L). The case problem involves a civil lawsuit arising from a landslide that trapped a hockey team inside a cave during a team-building field trip. The Plaintiff, an 18-year-old hockey player who was severely injured during the rescue effort, alleged the Defendant, the cave-touring company, failed to properly protect the group by cancelling the trip or taking proper preparations in the face of dangerous weather and significant warning signs. The Defense alleged it took reasonable steps to prepare and protect the team, that the Plaintiff assumed the risk and/or was otherwise contributorily negligent for his or her own injuries. The Defense argued that the real cause of the injuries was the negligent rescue efforts of a third party. The competition teams were tasked with being able to try both the Plaintiff and Defense sides of the case. Preliminary round trials are decided by a panel of three to five judges comprised of attorneys, judges and other legal professionals from the area. Judges scored the student advocates based on their skills in opening statement, direct examination, cross examination, closing argument, and knowledge of the rules of evidence. Over the course of three days, Akron’s competition teams swept through the preliminary rounds, each with a 3-0 record. Akron’s first team bested stiff competition from Cleveland State, Michigan State and Notre Dame, while Akron’s second team defeated top advocates from Case Western Reserve, Drake, and the University of Michigan. Their efforts earned each team a place in the Semifinals when the field was cut from 16 to 4. There, Akron’s first team defeated the University Michigan, and Akron’s second team won a hard-fought trial against Notre Dame, setting up a final that would guarantee Akron its fourth consecutive regional title and trip to the National Championships. It was also the sixth all-Akron final round since 2008. The Final Round was extremely close as both teams put on championship-caliber performances. A panel of five judges issued a split decision with just nine points separating the two teams. Ultimately, Cassandra Rosa, Imokhai Okolo, Justin Morgan, and Sarah Blank won the day on the Plaintiff’s side of the case and earned their trip to Philadelphia. The tournament was another great step in Akron Law’s mock trial season which has already featured second-place finishes in the National Institute for Trial Advocacy Tournament of Champions and the Michigan Bar Association’s National Trial Advocacy Competition in the fall, as well as a second-place regional finish and invitation to the National Black Law Student Association Constance Baker Motley National Championship Tournament. Akron’s AAJ teams were coached by alums Tony Wise (’13), Greg Thompson (’12), and Kevin Kita (’11).